One of the things we just had to do while in Dubai was going to Atlantis for the dolphin experience at their dolphin bay. This is one experience from my post 6 Must Do Things in Dubai with Children that needed a post of its own! I would have loved to swim with them but unfortunately I can’t actually swim so that was out of the question. So it was a choice of either having a photo experience which lasts around 10 minutes and you do not get in the water, or the dolphin encounter where you actually get into the water with the dolphin. Although it isn’t cheap, it was a once in a lifetime experience so I decided to opt for actually getting into the water and I don’t regret it for one second! Hubby wasn’t keen in getting into the water so he could have stayed out and taken pictures of us. However his photography skills aren’t very good and seeing as he would have had to still pay almost half just for the privilege of standing on the side and taking the pictures I decided to make him come in with us. The cost is basically the entry to Aquaventure Waterpark as you have to go through there to get to the Dolphin Bay. I do wish that they would half the price of the experience if you are not planning on using the water park. The dolphin encounter is in a number of stages. First you are taken to pick either a wetsuit or a life jacket to wear in the water. They had all sizes including a small one for Bee. Lockers are provided for personal possessions for the duration of the experience as you are not allowed to take cameras, wear jewellery or have any hair bobbles or clips in your hair. Then you are taken into another room to watch a short video about dolphins and a quick brief on how to behave around them and the places they should not be touched. Once you are placed into groups of 10 you then go out to meet your dolphin. I did feel like the whole process was slightly rushed and just felt like a conveyor belt. By the time I got myself and the girls changed they had already moved onto the next room and I had no idea where to go. We ended up where the dolphins were but thankfully someone spotted us and took us to where the video was being shown. 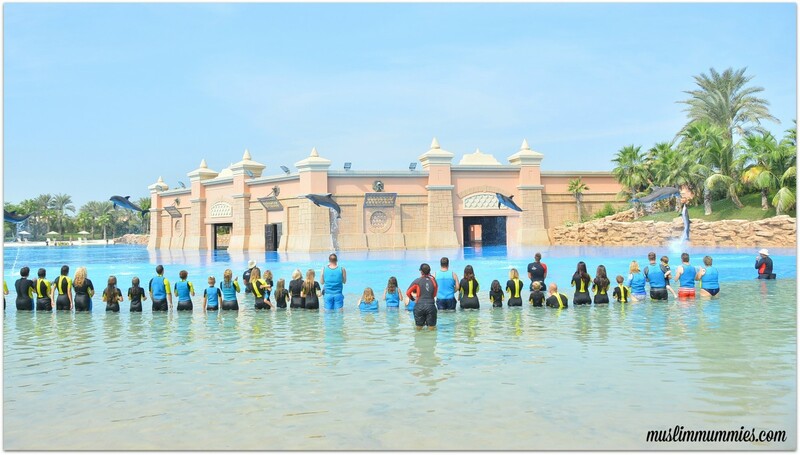 There were 2 staff members during the whole experience, One who was the main dolphin trainer while the other was there to oversee the visitors. At one point I did get slightly upset as one of the staff members asked us to move up the line because we were at the end in the deeper part and she could see it was a bit much for Bee. We then practically got told off by the dolphin trainer that she was not going to bring the dolphin to the shallow end as it could hurt the dolphin…however the whole point was that if we were at the top end of the line then the others could shuffle down a bit so we weren’t in the deep end. However she had missed her colleague asking us to move. I chose to ignore it and not let it ruin our experience. 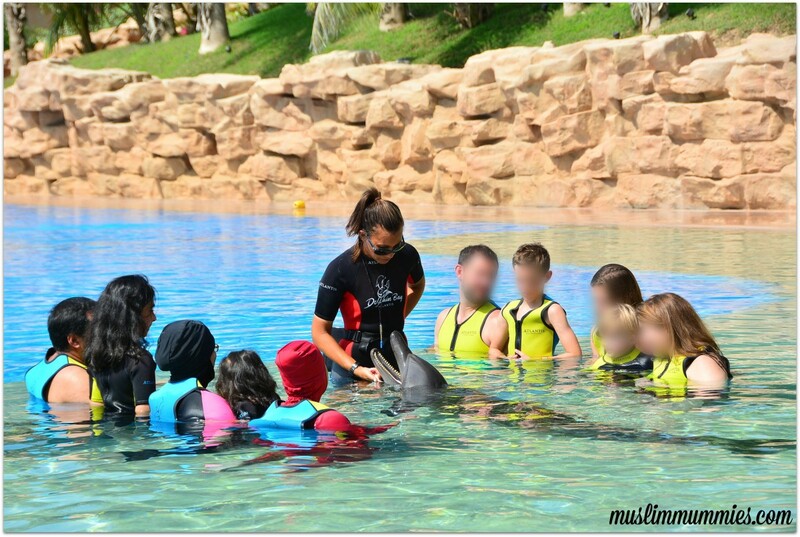 The dolphin trainer clearly loved the dolphin and was just looking out for her safety and ensuring she did not come to any harm. Our dolphin for 30 minutes was called Iny who was 12 years old. And she did appear to be very friendly. We had a lot of interaction with her, she was brought swimming past us a number of times in our line and we could touch her as she went past and then we all went out of the line for individual kisses. After that we all could then individually either ‘dance’ with her or play with her which involved throwing a ring out as far as we could and she would bring it back. We could then have an individual picture while holding/hugging her or one family picture. As we had individual pictures kissing her we opted for a family picture. However the photographer didn’t mention that Bee’s face was hidden by the dolphins fin so that ruined our family picture. As the pictures are extremely expensive to purchase it did upset me slightly. We ended up purchasing all the photos on USB (about 60) and 10 prints for over £100. Finally all the groups come together to see the dolphins do a final jumping display. At the end of the experience you are provided with towels if you need them and also can help yourself to soft drinks. My favourite part out of the whole experience had to have been getting a kiss from her. And even hubby who was grumbling about having to get into the water had the time of his life and loved interacting with the dolphin. For the amount of money you pay though (I think once the money was exchanged it was around £130 per person), it would have been nicer to spend a bit longer with the dolphins. Book direct on their website as usually the best price can be found there. Book 14 days in advance and get a discount. (100 AED per person). The price includes entry to the waterpark so you can make a day of it. Book in advance, not just for the discount but because it is an extremely popular experience and if you wait until the day you may find out they have no more spaces left. I would advise that you if you do opt to do this then you arrive with plenty time as it is quite a trek to get to the Dolphin Bay. However there is a stop for golf type buggy’s which can take you half of the way but again they can be quite busy as they are for the use of the whole Aquaventure park. You may want to wear your swimming costume underneath your clothes as there is no privacy at all in the changing rooms. What a great review sis! Enjoyed the pictures! What a shame your daughter was covered by the dolphin’s fin, for that amount of money the photographer should have made sure everyone was in the picture. And it sounds like these trainers need a refreshers course in customer service. Yes was a shame…I was so upset. But no point arguing about it as they wouldn’t have let us back in to get the pic taken again. It was basically get your picture taken and get out of the way for the next ones! Yes it is too expensive. Though I live in UAE I avoid Atlantis for various reasons. I am glad that you had good time. But, the trainers need to be more courteous. This picture is lovely, it is one of my favourites…it was another one with my hubby and other daughter where Bee’s face was covered that I was upset about. I’ve always wondered about this because I don’t swim either so it’s good to know that it’s still an option. A once in a lifetime experience you won’t forget! What a wonderful experience. This sounds so much fun.